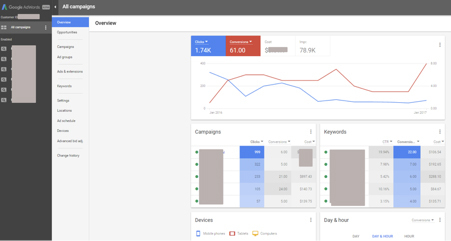 A Look at the Design of the New Google AdWords Interface. We asked Faranaaz Vraagom, Campaign Manager at Conversion Science, to describe her experiences and this cloud has a silver lining after all. We are creatures of habit, thus, we become accustomed to doing things in a certain way and enjoy the attendant routine and predictability. This is certainly true for myself and any change to my routine elicits some degree of anxiety. When I was confronted by the new AdWords interface, I scanned over it for 5 seconds and decided that I disliked the layout from the onset and switched back to the old interface. Not only was this new interface more colourful but everything was not where it was supposed to be! It felt like I had to learn the AdWords layout all over again and this transported me back to my first months at Conversion Science when I was a naïve but excited Intern ready to conquer the PPC world. Mwahaha! What did I discover? I found that my reluctance to embrace change had stopped me from utilising a whole new set of features that would have helped me to improve campaign performance. I am not suggesting that an acceptance of the interface will magically quadruple your conversions or increase revenue by 100% but it will, over time improve key metrics such as CTR, User-Experience and invariably Conversion Rates. The two key features that I would like to highlight below are Promotion Extensions and Landing Pages insights. This is a new ad extension that is exclusively available in the new interface. These extensions can be used to advertise specific offers that you are running on your site and link to the landing page containing the offer. What is great about these promotion offers is that you can use them for FOMO-type campaigns and to derive a few of the benefits of a Shopping Ad in a normal Search Ad. It is more invaluable real estate. These tools add a little spice and an inevitable countdown to mark the client’s USPs. It is the latter strategy that I employed for one of our clients whose USP is a percentage discount on their delivery service. When analysing one of the campaigns for a period of a month, the Promotion Extension I used, had the highest CTR compared to the other ad extensions in the campaign. It also had the second highest number of conversions and second best performing CPA. Although it’s a small sample size we are working with, the initial results are encouraging. 1(As ratified by the Effective Measure Report, 2017). The second new feature that I would like to highlight is the new Landing Pages tab. In the previous AdWords experience, we had some insights into the performance of our landing pages when analysing Quality Scores of keywords. However, with the new Landing Pages tab, AdWords has enhanced the feature and now drills deeper down into landing page experience in relation to device type. Now you can see which landing pages are mobile friendly and which ones are not. This is particularly important in the South African market, where access to Desktops and Wi-Fi is limited. Mobile devices then become a primary means for a large majority of people to access the internet. The 2017 Effective Measure Survey of the e-Commerce industry shows that 27% of people shop in-store online while using their Mobile devices and it is expected that this number will increase in the years to come. Therefore, it is important for e-Commerce sites to be cognisant of this growing segment of online shopping behaviours and tailor their product and website accordingly. This increase in mobile shoppers is evident in one of our new campaigns, where “Mobile” has brought in more conversions than either “Computer” or “Tablet” in the first month. For this client, we have gleaned that a substantial portion of their customers seems to use Mobile devices to shop. And in so doing, we can feed back to client when they need to make changes to their site or optimise for device type. In conclusion, I hope that I’ve provided some useful insights as to how one can utilise some of the aspects of the new AdWords interface to optimise campaigns and improve performance. There are still many new features that I need to discover and learn about but I am certain that they will prove beneficial to my campaigns in some way. We are sometimes resistant to change because we have come to expect things to be a certain way – there is security in this and it is intrinsically human. Nonetheless, with most positive, innovative changes, fresh possibilities and opportunities abound. This is certainly true for the new AdWords interface. After the initial frustration with the new layout and navigation, I have seen the light and have come to embrace the re-invented AdWords interface and all its innovative features.